All children in the Nederland attend primary school from age 4 up to 12 (grade 8). At this point the school system divides children into vocational schools (which have as a focus training in a particular profession) and general schools (which have a more academic focus and are for children who will possible continue to higher education). 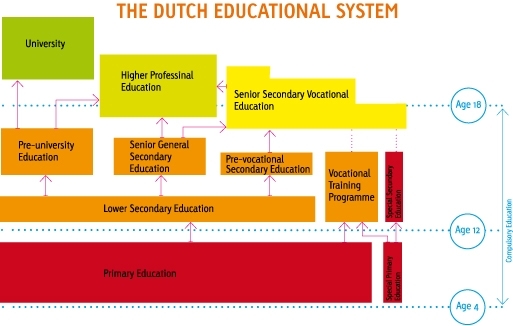 Also in the Dutch educational system is a division in schools with a denominational background and schools without. All schools are funded from general taxation. The teaching of religion, Religious Education and religious views differs from school to school. All primary schools are compelled to teach about religion. However since 1985 children up to 12 years must also be taught to understand different (world) religions and world views. The law states that the aim of acquiring this 'knowledge about religion' is a way of becoming more tolerant in everyday life though the question how this knowledge renders tolerance has not sufficiently been researched. Alongside to this teaching about religion schools with a confessional background (e.g. Christian, Roman Catholic, Islamic, or Jewish) often teach into their own religion (but not catechismically). After the age of twelve Religious Education is not obligatory. Vocational schools tend to teach ethics related to the profession pupils are being trained for. Sometimes this is combined with training to be a good citizen. Recently social and emotional behaviour are also included. In confessional schools there is often the teaching about the religion of the tradition included as part of the curricuulum. In the upper secondary schools and in Higher Education (University and Higher Vocational Education) the teaching of religion or Religious Education is not statutory. Denominational schools mostly teach about world religions and their own tradition. Knowledge of the most important views on (world) society, modern political issues and views on life are taught in secondary schools. In university education is mostly restricted to the chosen field of study. Within the primary schools there is a relatively strong position of Religious Education both multi faith teaching and sometimes combined with the teaching of a particular tradition (especially in the denominational schools). In non-confessional schools parents have a constitutional right in asking for their children to be taught the religion of their choice and for their child to be taught by a specialised teacher from outside the school. In secondary and vocational schools Religious Education is not compulsory whilst teaching into being a good citizen is compulsory. Schools make their own choices as to whether they offer Religious Education and Ethics. Also, the distinction between confessional and non-confessional schools seems to be disappearing. In the rural communities small schools (mostly primary) are often merging so the confessional and non confessional school become one school. This raises the question how the teaching of Religious Education can be combined in the curriculum. This has implications for Religious Education with regard to the wish of some parents to have their children taught into the own religion (see above). ​For everyone this is an interesting time to be a teacher of Religious Education or a board member. Religious Education is not irrelevant but it is sometimes vulnerable.